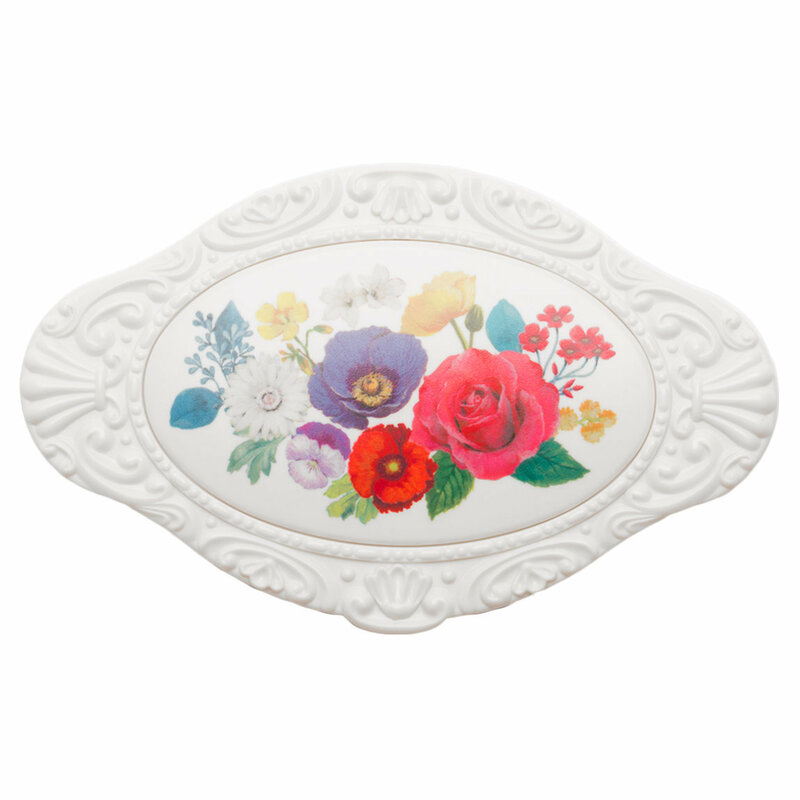 Embellished with a whimsical floral pattern, this vintage-inspired palette compact holds up to six pans of Anna Sui Eye & Face or Lip & Face Color (sold separately). Arrange your choice of makeup pans inside the palette. 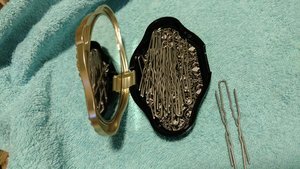 The magnetic base will secure them in place. I bought this not for shadows but for my Amish hair pins. It is the perfect shape and size for them and this makes me very happy. So I am only taking off a star as it is not its intended use. Perfect to put my Blotterazzi, fancy touch ups! So I bought the palette cause it looked so gorgeous, and it is, also amazing quality, comes with a really good mirror. But honestly, after reading reviews regarding the eyeshadows, they don't seem to be on my alley. So I just got the palette case and thought it was perfect to have in my bag for touch up. Turns out my Blotterazi fits perfect in there, so for me its the most amazing Blotterazi case (since the one that comes in, it´s not super fancy). 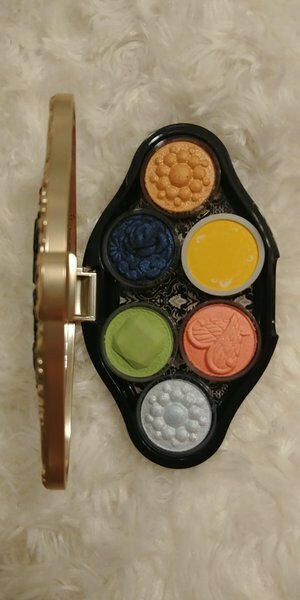 This design really caught my eye and is very functional, hold all of the intended eye shadows from the brand. I don't know why others would be using it to hold other eyeshadows and things because it just wouldn't work the same way. 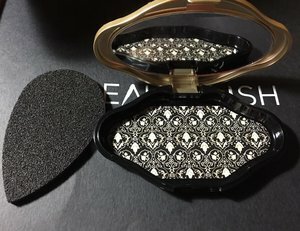 It is perfectly meant for just the eyeshadows and they hold together nicely with the magnet. I'm not sure if it will be strong enough while travelling though. Even though Anna Sui products are very cute, there always seems to be that conflict with quality and how these cute designs are produced. They are not produced with the best and most amazing quality, that the designs portray if that makes sense? But I guess that also makes it more affordable while still being very cute. It seems sturdy enough. Fits 6 small pans. Fits is the operative word, because this palette will not actually 'hold' your pans, as it's not magnetic. Not sure what I'll actually use it for now, because I refuse to use it for my pans if they're not safe from bumping around. I love Ana Sui because it's a little Victorian, a little goth, and all beautiful. The detailing and vintage, old world look of her products are even more attractive because of the price. They are just beautiful. Highly recommend this collection. Cute but looks cheap, it makes noise when empty and really impractical since it isn't magnetic. Returning. The palette is beautiful and the details are lovely. I get tons of compliments on this wonderful piece of art. My only issue is that the magnetic feature is very weak, none of my magnetic pans stay put.